Best known for: Built and ran the first successful commercial steamboat. Where was Robert Fulton born? Robert Fulton was born on a small farm in Little Britain, Pennsylvania. When he was six years old, his family lost the farm and was forced to move to Lancaster, Pennsylvania where his dad worked as a tailor. A few years later, tragedy struck the family again when Robert's father died. As a boy, Robert loved to build things and experiment. He made his own lead pencils, built mechanical paddles for his boat, and even made fireworks for a Fourth of July celebration. Robert also liked to draw and was a very good artist. At the age of fifteen he went to work for a silversmith as an apprentice. After a few years working as an apprentice, Robert moved to Philadelphia to pursue a career as an artist. He managed to make some money painting portraits and was able to buy his mother a small farmhouse. While living in Philadelphia, he met several famous people including Benjamin Franklin. In 1786, Robert went to Europe to further his art career. While living in Europe, he began to study science and mathematics. His interests shifted from art to invention. Robert was especially interested in canals and ships. He came up with new ways to dredge canals, to raise and lower boats, and to design bridges. He also invented a tool for spinning flax into linen and a machine to saw marble. Fulton moved to Paris in 1797. While in Paris he designed a submarine called the Nautilus. Many consider the Nautilus to be the first practical submarine. Fulton successfully tested his submarine in various situations. It had a hand-cranked screw propeller that enabled it move under water. He successfully submerged to a depth of 25 feet and remained there for an hour. In order to progress, Fulton needed money to build and test more submarines. Through his friends, he had a meeting with Napoleon, the Emperor of France. Napoleon, however, thought that Fulton was a crook and just wanted his money. He told Fulton that if he could sink a British ship with his submarine, then he would be paid. Later, the British government convinced Fulton to switch sides and go to work for them. Fulton's next idea was to build a boat that was powered by a steam engine. He partnered with New York businessman Robert Livingston who agreed to fund the project. Robert's first steamboat quickly broke apart and sunk. However, he didn't give up. He learned from his mistakes and, a year later, successfully tested out his first steamboat in England. Robert now wanted to build a steamboat in the United States, but he ran into a problem. England would not let him take a steam engine out of the country. They were trying to keep the technology of steam power for themselves. After almost two years of working, he was finally permitted to bring a single steam engine to the United States. Fulton and Livingston used Fulton's steam engine to build the North River Steamboat (sometimes called the Clermont). It was launched in 1807 and operated on the Hudson River. The boat was a great success. Soon, Fulton and Livingston had more steamboats built. They branched out to other areas including the Mississippi River where they introduced a steamboat named the "New Orleans" in 1811. They built a successful business and introduced the steamboat as a new form of transportation to the world. Robert Fulton didn't invent the first steamboat. Steam power had been used previously by other inventors to power boats. 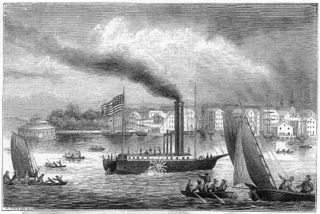 However, Fulton did invent the first commercially successful steamboat and brought the technology of steam power to the rivers of the United States. Fulton's steam boats helped to power the Industrial Revolution by moving goods and people throughout the United States during the 1800s. 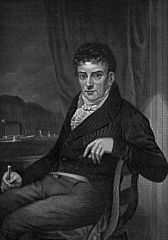 Robert Fulton fell ill and died of tuberculosis on February 24, 1815. Many people thought that Fulton's idea of a steamboat was a joke and referred to his first boat as "Fulton's Folly." He married Harriet Livingston in 1808. They had four children together. He designed a steam warship in 1815 for the US Navy to help fight the War of 1812. He died before the construction was completed. Fulton had planned to build a second Nautilus submarine for the British, but the British lost interest after they defeated Napoleon.